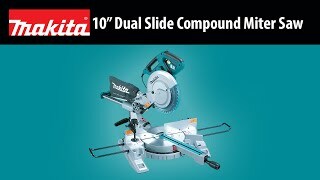 The Makita 10” Dual Slide Compound Miter Saw (model LS1018) delivers large cutting capacity and accuracy right out of the box. With the LS1018, you'll get all the cutting performance you need in a slide compound saw, but with less weight (only 43.7 lbs.) for increased portability. Jobs like cutting baseboards and crown molding are a snap, but it also has the capacity to cut 4x4 dimensional lumber in one pass. It's ideal for fine woodworking, carpentry, general construction, and more. The LS1018 is powered by a 13 AMP direct drive motor with soft start, a key point of difference. This means smoother start-ups and consistent, constant power with no belts to slip or replace. The electric brake provides added convenience. The LS1018 will tackle the most demanding jobs while keeping production high. Max. Cutting Capacity (miter 90°) : 3-5/8" x 12"
Max. Cutting Capacity (miter 45°, L/R) : 3-5/8" x 8-1/2"
Dimensions (LxWxH) : 21-1/8" x 32-1/2" x 25"
Net Weight : 43.7 lbs. Shipping Weight : 51.7 lbs.